Iron & Steel Technology is the premier technical journal for metallurgical, engineering, operating and maintenance personnel in the iron and steel industry. 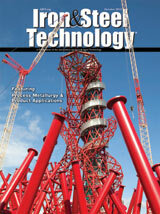 As the official monthly publication of AIST, Iron & Steel Technology is the most comprehensive and widely circulated journal available today, dedicated to providing its readers with the latest information on breakthroughs and trends in equipment, processes and operating practices in the international iron and steelmaking industry. Each month in Iron & Steel Technology readers will find timely peer-reviewed articles addressing theory, technology and practical applications, and the in latest industry news, product and professional highlights, as well as an industry-wide calendar of upcoming seminars, meetings and events.